Aw Yeah! 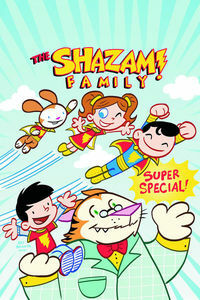 TFAW Interviews Art Baltazar and Franco! 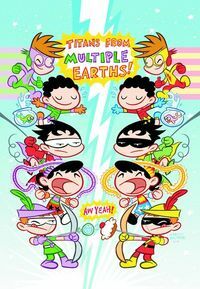 Kids Comics Month is really hitting its stride with this awesome (and hilarious) interview with Tiny Titans creators Art Baltazar and Franco! If you haven’t picked up Tiny Titans yet, what are you waiting for? 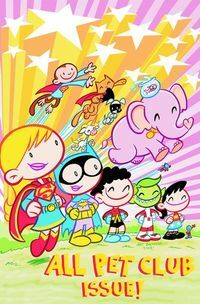 Not only did this fantastic comic win the 2009 Eisner Award for Best Publication for Kids, but this off-the-wall book is funny, sweet, and offers a plethora of in-jokes to fans of ’80s-era Teen Titans. 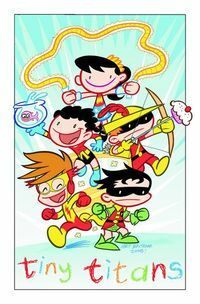 This makes Tiny Titans the perfect series for today’s comic book fans to enjoy with the tiny readers in their lives. 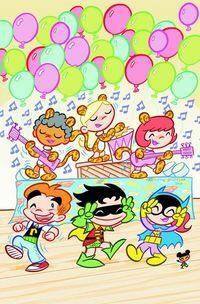 Read on to learn about the genesis of Tiny Titans and Little Archie and discover what Art and Franco’s next collaboration, Young Justice, will be like! TFAW.com: Thanks so much for taking the time out of your schedules for this interview. 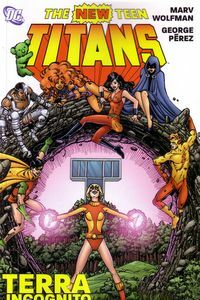 Plus, I’m a huge fan of Tiny Titans, so it was a great excuse for me to read everything again to prepare. TFAW.com: First, since I don’t know your voices really well, could you quickly say which one is which? Franco Aureliani: I’m the one who sounds really good looking. Art: Yeah, and I’m the one who sounds like he needs to take a shower. TFAW.com: Perfect! Okay, how did the concept for Tiny Titans start? Art: Jann [Jones] from DC called me and asked who my favorite DC characters were. And I told her Teen Titans, and that’s it, pretty much! She said she had a concept that she was working on for kids books, and she had an idea for a title called Tiny Titans. So I guess I had the right answer! It was real strange how things came together just through conversation. But that’s the way it happened. She had an idea, and I said the right thing, and we kept going. TFAW.com: How did Franco get involved? TFAW.com: How does your collaborative process work with the writing? Franco: Ummm . . .
Art: Ummm . . .
Franco: The way it always does! On the phone! Art: Yeah, we talk on the phone, write stuff down, and when we’re done, we send each other emails, and make stories up from our notes and stuff. We talk, probably, a little bit every day. And now with Skype, it’s free! We don’t have to pay those big bills no more! Our phone bills went down a lot with Skype. 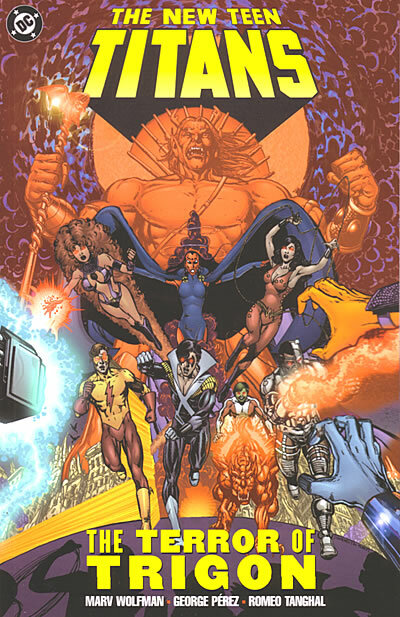 TFAW.com: You said these are your favorite characters, so you must have read a lot of the original Teen Titans books? Art: Yeah! Both of us were big fans of the George Perez-Marv Wolfman comics. And we also read John Byrne’s Superman: Man of Steel, and all that stuff. Well, we read all comics, we’ve been reading them since we were kids, since we were 6, 7, 8 years old. So this is what we know–the comics, and we know all the characters. There’s nothing else we can do but make comics. We’re not good at anything else! Franco: Yeah we are! We’re just really good at making comics. Art: Yeah, Franco can dance real good, too. Franco: Yes, I’m very tall and Caucasian, so I do a very good White Man’s Overbite. TFAW.com: What’s so great about Tiny Titans is, if you have any history with the DC universe, there are all kinds of in-jokes. Just the fact that so many villains, like Trigon, are schoolteachers! That must have been a lot of fun for you guys to set up. Art: Oh yeah! There’s no fighting in the book, just funny stuff. DC told us they wanted us to make Patrick the Wolf Boy books, but with DC characters. So that was pretty easy for us to do, since we were doing that already. We just had to change the costumes on the characters, since a lot of the Wolf Boy characters are kind of the same style, like Robin and Patrick kind of look the same, and Wonder Girl and Patrick’s little girlfriend look the same, so it’s kinda like the same style. We just went with what we knew. TFAW.com: Were there any other challenges to adapting the Teen Titans to a kids’ book? Were there certain things you had to keep in mind? Franco: Ahhh . . .
Art: Ahhh . . .
Art: Yeah, we had actual superheroes fighting in our first issue. So there’s no fighting, there’s just jokes. Comedy. 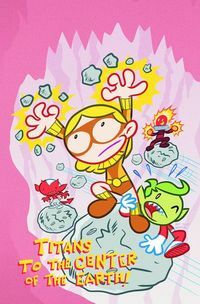 TFAW.com: You’ve had a lot of fun bringing on past characters like Tara and playing on her relationship with Beast Boy in the original comics, and playing off that in Tiny Titans. Are there any characters you haven’t been able to play with yet that you’re going to introduce? Art: Oh, they’ll all be in there. We just have to figure out how to get them in there. We have access to the whole universe, to everyone in DC, so if there’s anyone you want to see, write to us! Franco: If you haven’t seen them yet, you will! Art: Yeah, you’ll see everybody. TFAW.com: I like that you recently had Hal Jordan on as basically his legs and feet: kind of like Muppet Babies. Art: Yeah, that’s the whole idea! We’re big Tom & Jerry fans, too, and Peanuts fans, and that’s the same kind of thing, from the kids’ point of view. TFAW.com: Did either of you read a lot of kids comics when you were kids? Art: Yeah, I think we just read comics! Back then, comics were just comics. There were no all-ages comics, because all of them were for all ages. That’s when they were writing for 12-year-olds. So we were the audience, so those are the books we read. We read X-Men and Spider-Man and Superman and Batman and all that. Franco: We also read stuff like Archie comics and Casper. Even those comics we read. I’m a big fan of Peanuts, and I love, love, love Calvin & Hobbes. All of those things have been influences on both of us. I like this interview! It’s very mellow. I like this! Art: We were influenced a lot by cartoons, like Tom & Jerry and Bugs Bunny, and I really liked Hanna-Barbera cartoons, and I was a big fan of Magilla Gorilla. Franco: Bugs Bunny is my favorite actor in the whole world. 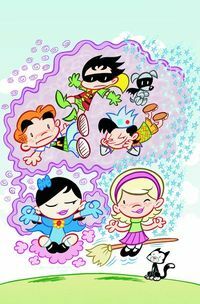 TFAW.com: Speaking of Archie, you’ve got Tiny Titans meeting the Little Archie gang. Who approached who about that? Was that your idea and you went to Archie Comics? Art: No, I got a phone call when we were on issue #3 or #4 of Tiny Titans–I got a call from DC saying they wanted me to do an Archie design so they could pitch to Archie Comics! So DC actually did that. It was kind of cool. I guess they had meetings with guys over there, and about a year and a half later, they said “Okay, let’s do it!” It was just one of those things that took time. I always knew it was on the backburner, but I never knew if it was going to happen. We learned that working in comic books, you get real good at keeping secrets. You know so many things you can’t tell anybody! Franco: You know, it’s so secretive, I don’t even know what Art looks like. I’ve never even seen him. 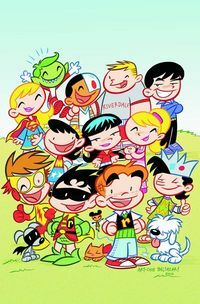 TFAW.com: For each of you, what was your favorite part of doing the Tiny Titans/Little Archie meetup? Franco: Umm . . .
Art: Umm . . .
Franco: The whole part of it was so much fun! Art: Yeah, the whole thing was just awesome! TFAW.com: Do you guys plan on doing another arc after this three-issue series? Art: Maybe. Yeah! We don’t know. I wish it was up to us! We should publish it on our own, but we would probably last one issue. Franco: And then we’d get sued or something. Art: But we hope so! We leave it open ended–they don’t burn bridges. They say, “Bye, see you later!” You never know what will happen. The future is out there. TFAW.com: You guys will also be working on a comic-book adaptation of Young Justice, a new cartoon on Cartoon Network, right? Franco: We are? Oh yeah, yeah, that’s right. Art: Yeah, we’re doing that now! TFAW.com: And that’s kind of like Teen Titans in that it focuses on the younger heroes in the DC Universe? Franco: It’s kind of like it, but nothing like that at all. Art: Yeah, yeah! It’s true. It’s the same characters, but it’s its own universe. You’re going to like it, because we got into it not knowing what to expect, and now we’re excited, because we’re seeing stuff that we didn’t know would happen. We’re learning as we go, and we’re seeing secret stuff too, which is awesome. It brings out the geek in us. TFAW.com: The series premiered November 26. I’m assuming you’ve seen some episodes already! Art: Yeah, we saw a few things. Mostly what people saw at San Diego Comic-Con. Franco: Well, but we saw a bunch of other stuff. They sent us some files and things. It’s pretty cool. Art: Yeah, you should watch it! Art: You should put it on your DVR. You should even record reruns, just so we can get the ratings up there! I tell everyone they should support every comic book movie, even if it’s not a good one. You should see it multiple times, because if you stop seeing them, they’re gonna stop making movies from comics, and we want them to keep making them. 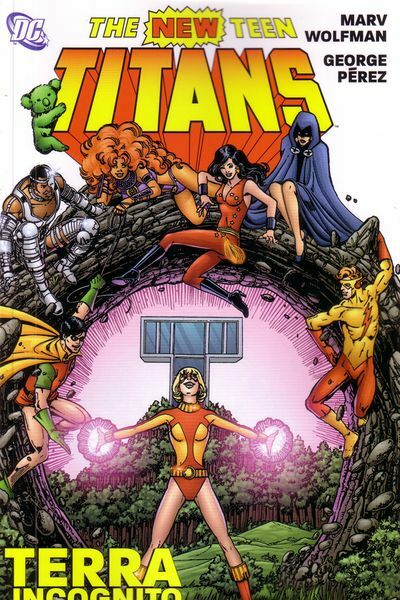 TFAW.com: I would love to see a Tiny Titans movie or animation. Art: Yeah, that’d be awesome! I should just start making them myself and then wait. Franco: We should make up our own episodes and put them on YouTube. Art: Yeah! We’ll just change the characters to make them look like Wolf Boy. We’ll have a Mr. Rrigun. TFAW.com: What do you guys think about the state of kids comics today? It seems like there’s a resurgence, after a couple of decades of focusing on older readers. Franco: We like to think we were the reason for all that. No, I think it’s just because it’s good comics. Art: I think back when comics were real real crazy popular, when we were buying Casper and Richie Rich and all that, it was just a go-with-the-flow kind of effort. And now, because you have to be strategic and business-wise, I think the comics industry, as kids go, there’s a conscious effort to make them and promote them. Before, you could make any comic and it would sell a million copies. Or thousands and thousands of copies. But now you actually have to do it in a way that you’re promoting it, so that people know they exist. Before, everybody knew what Archie was, and Richie Rich, and Sad Sack, but now you feel like the comics industry is focusing on kids comics, and that’s intentional. You want people to know what you’re doing now. That’s what I’m seeing anyway. Now everybody’s talking about all-ages comics because it’s very important. Comics have been getting older, for older readers, and people like us, who read Teen Titans and Avengers, we’re in our 40s now. So if we don’t give comics to new kids, the comics industry will last maybe 25, 35 more years, until we die! Then that’s it. Everything will be gone. So that’s why we need that effort. Franco: I think as far as comics for kids, they haven’t always been labeled as such, but they never went away. I remember growing up, when I was reading Calvin & Hobbes and all this other stuff as well. And a good comic wasn’t a kids comic and it wasn’t an adult comic–it was just good, it was funny. That’s why it worked. And I think now that’s there’s this conscious effort to market it [kids comics], and we’ve never had that before. That’s why it seems like there’s a resurgence in kids comics. But I don’t think they ever went away. Art: I like to call this the awesome age of comics. You’ve got Modern Age, Bronze Age, Classic Age, whatever–this is the Awesome Age. Because everything you read from us is awesome. TFAW.com: Well I certainly agree with that! Okay, I’ve got one more question: Where did the “Aw Yeah!” come from? Franco: That’s Art! That’s just something he does. Art: That’s the way I talk! Art: Aw yeah, man! Let’s go! Franco: So that was it. Art: It’s funny, we were at a lunch meeting, and Tiny Titans hadn’t even come out yet, and they [DC Comics] said, “Do they have a catchphrase, like a battle cry?” And I looked at Franco and I just said, “Aw yeah, Titans!” And that’s it! It stuck! Our thanks again to Art and Franco for the funniest phone interview I’ve ever conducted. While you’re here, make sure to pick up some Tiny Titans and Tiny Titans and Little Archie comics. 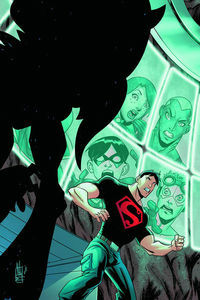 Plus, you can pre-order Young Justice #1 and save 35% in December! Are you a Tiny Titans fan? Which DC character would you like to see appear next? Post your choice below! Previous article Comic Book Reviews: Let Me In, Fables #100, Starborn & more! The Walking Dead Celebrates Landmark 100th Issue! Artists Step up to Be Counted With CBLDF Membership Art Auctions!